Hello friends! What a great week we had here at Butterfly Kids Yoga. Whether our paths crossed in classes, at yoga in school, a birthday party, Yoga for Athletes, or at our fundraising event, I hope your kids (or you!) enjoyed yoga this week. Ages 3-5 at M/Body @ 9:30am. Enroll here. * Take a M/Body Barre class for yourself at the same time! Enroll here. Ages 5-12 at East Side Wellness Center @ 6:00pm. Enroll here. Adult yoga (with Jessica) at East Side Wellness Center @ 6:00pm. Enroll here. Coming to both classes? Take advantage of our 1 Adult + 1 Free Kid pass when you enroll. Ages 5-12 at East Side Wellness Center @ 6:00 - 8:00pm. Yoga, dinner, disco ball yoga dance party and calm moments to end the night. Plus, parent perks from our partners with purchase. Make it a yoga night for your kids plus a night out for you! Enroll here. Ages 5-12 at East Side Wellness Center @ 11:00am. Enroll here. Yoga for Athletes, ages 8-13 at Next Level Strength & Conditioning @ 4pm. Enroll here. Yoga for Athletes, ages Adult / Teen at Next Level Strength & Conditioning @ 5pm. Enroll here. Take advantage of our special “Bring a Friend” deal! Bring a friend and you both get 1/2 off your pass! Just $9 each. Simply enroll online and pay at the door. Have a great week and hope to see you on the mat soon! PS. Planning ahead? Check out our full schedule here. A big thank you to all who came out on Saturday morning for Family Yoga and to support the Best Buddies organization of Rochester, NY! A great event for a great cause. 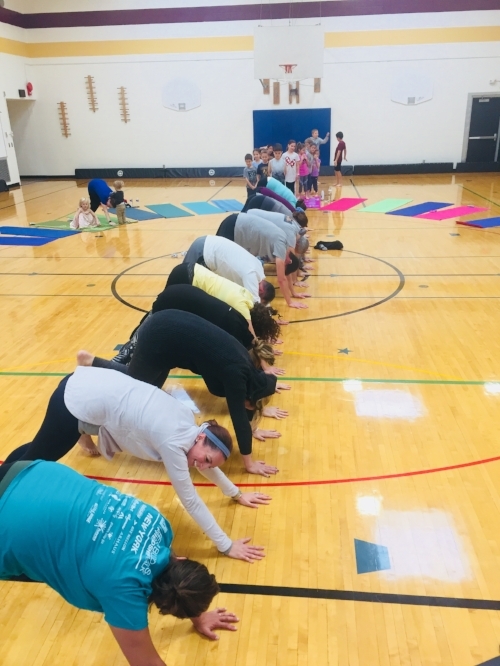 Check out all the parents who downward-dogged it while the kids got to cobra-crawl through!